And so it is in business. Our businesses have always been judged, by competitors and consumers alike, by our professional connections: do we employ reputable accountants and lawyers? Are our web designers well-regarded? You get the gist. Well, now the same can be said of your reviews solution. We will illustrate this with an anecdote (names and locations will not be disclosed, but all other information is factual). Back in September we were invited to pitch our review management service to a reasonably substantial multi-location business. As always in these situations we first did our homework (we call this a 'review audit', as every client will know). We take an in-depth look at the business - on its own website(s) and in search. In this instance there was much to see. Beginning with Google (after all, the first port-of-call for almost all consumers): few of their locations passed the Google filter (they scored between 1.2 and 3.7 in the main). Then onto the independent reviews sites, where there was an intriguing pattern. They appeared on no less than five separate sites, but that was not what interested us - we were immediately struck by the disparity in scores between the sites - from less than 2.0 out of 5 on three but virtually perfect - way above 4.0 - on the other two. Why have you invited HelpHound to pitch? What strategies have you adopted in the past? Why are those not working for you? How do you imagine that HelpHound will be any different? So far, so good. Or was it? 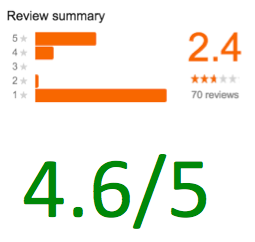 Why would the same business in the same location score so badly on Google and so well on the independent reviews site? "We were sold those two solutions on the basis that we could pick and choose which clients to invite to write reviews." ...oh dear. We explained why there would have to be a change of mind-set if they were to come aboard with HelpHound. And at that point we agreed to call it a day. When will some businesses (and nearly every reviews site) get it? That if reviews are to work for your business, they must be seen to be genuine, not just the individual reviews themselves, but the overarching methodology of the reviews mechanism the business adopts as well. It must not favour the business over the consumer. Goodbye Yelp - why would the biggest reviews site on the planet quit the UK?